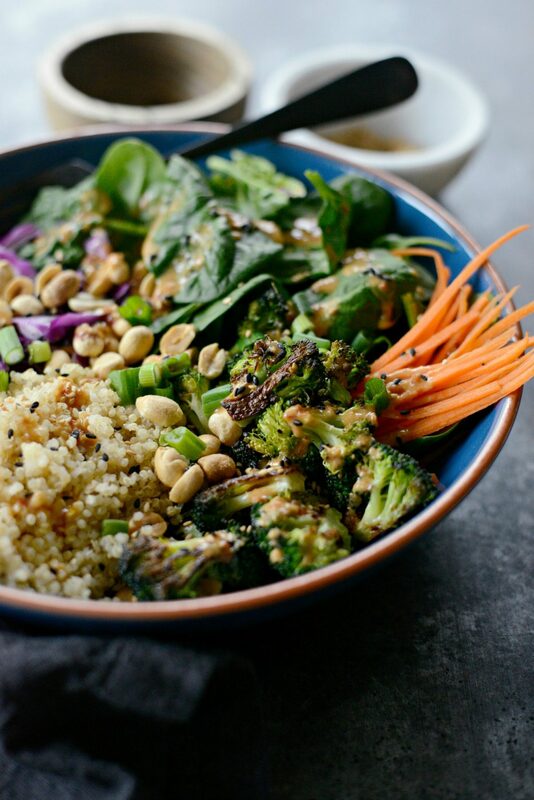 This Asian Charred Broccoli Quinoa Bowl is filled with nutritious goodness. 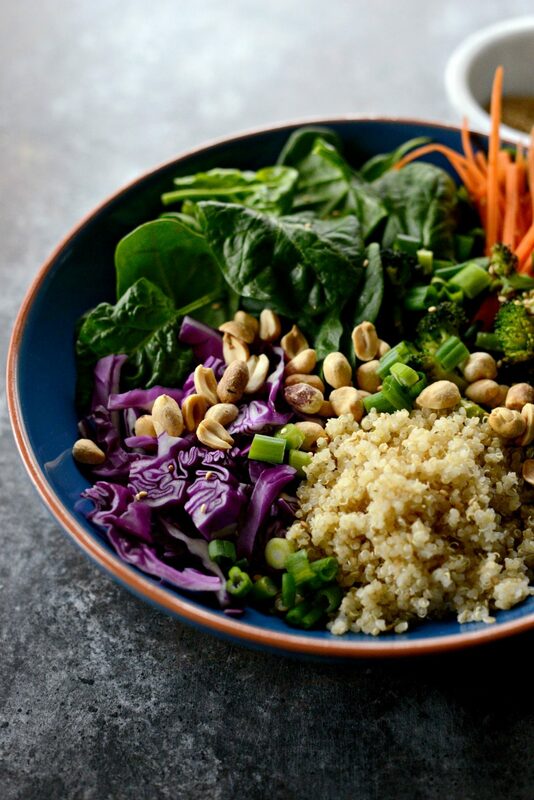 Roasted broccoli, spinach, purple cabbage, carrots and quinoa, topped with green onions and chopped peanuts. The easy and creamy sesame dressing seals the delicious deal. Prepare to fall in love. This is what happens when one cleans out an overly stuffed vegetable crisper. I just wanted to make something that I could have for lunch over the next few days. I have a cold (thanks, Pat) so I wanted to have a few effortless lunches at my disposal, plus I was grocery shopping the next day and I had all these vegetables I wanted/needed to use up. Ya know, to make room for the new veggies. I had things like broccoli, carrots, leftover spinach from making this for dinner last week and cabbage from this salad. I honestly had zero intentions on blogging it or sharing this Asian charred broccoli quinoa bowl. But I’m so glad I did! 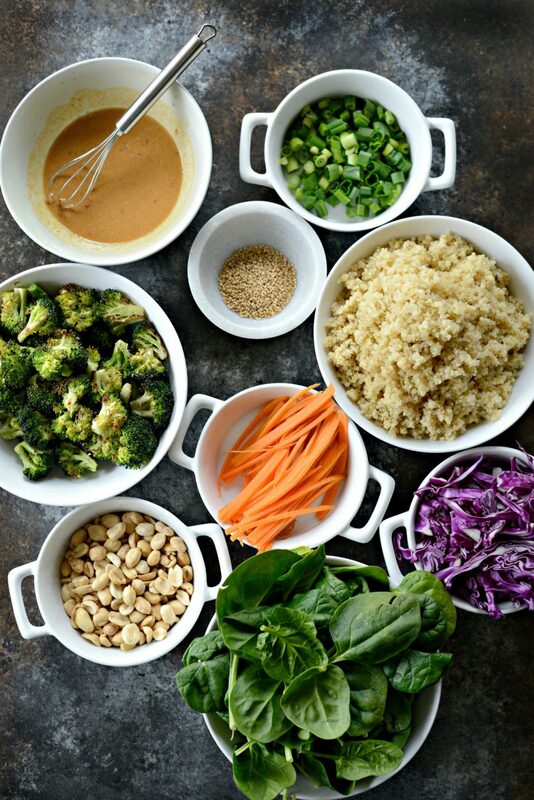 This sort of falls under the Buddha Bowl concept; all nutritious ingredients (usually plant based and a grain of some sort) tossed together in a bowl. You can also customize this to what you like. Have avocado? Throw it in there! Like bean sprouts? Go for it! I love lunchy bowls like this and I could eat this particular bowl of goodness every single day. 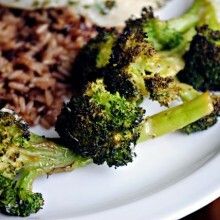 Start by cutting a large crown of broccoli into medium sized florets. Throw them on to a rimmed metal baking sheet, toss with 2 tablespoons extra light olive oil and a few pinches of salt. Next bring 2 cups of water to a boil. Stir in a cup of quinoa (any kind: red, white or tri-colored) and continue to boil for 5 minutes. Then cover, turn off the heat and leave the pot on the burner (turned off) for 20 minutes. Then remove the lid and fluff with a fork. During the 20 minutes that the quinoa is on the stove, slide the pan of broccoli into the preheated 500° oven for 8-10 minutes. Let cool. While everything is on the stove top and in the oven, move on to the rest of the prep; slice the cabbage and green onions, julienne the carrots —I have this that I use and LOVE it– and lastly, chop the peanuts and quickly whisk together the dressing. 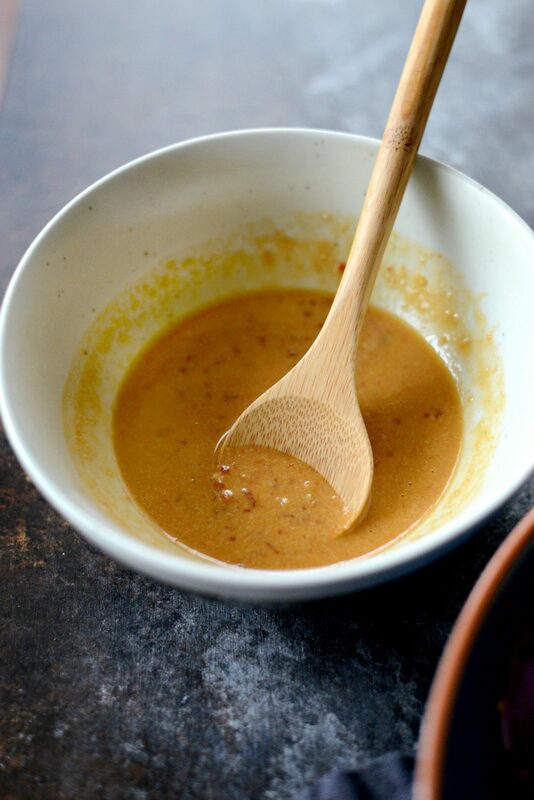 To make the dressing, stir together 1 teaspoon of grated ginger, 2 teaspoons chili paste (sambal oelek), 4 teaspoons low-sodium tamari, 2 to 3 tablespoon tahini, 3 tablespoons toasted sesame oil, 3 tablespoons rice vinegar and season with a pinch or two of salt, to taste. 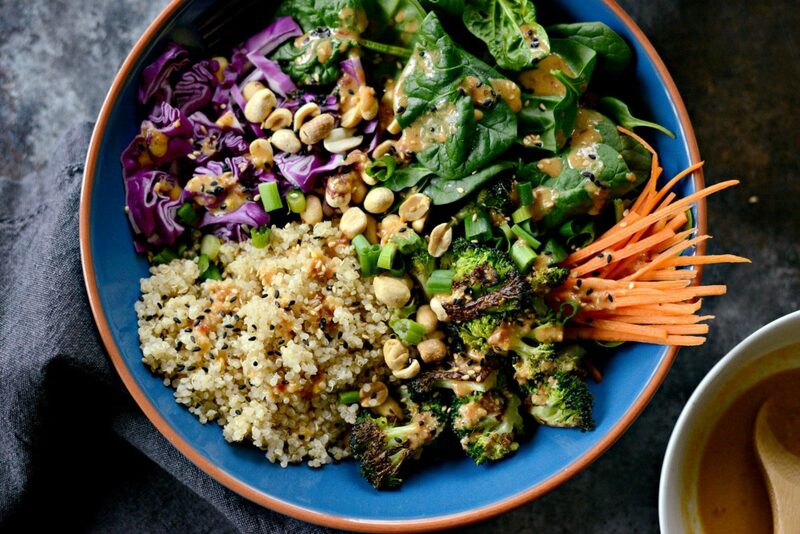 Next divide the spinach, quinoa, broccoli and cabbage into bowls. Top with peanuts, green onions and sesame seeds. I love the crunch and nutty flavor that peanuts add, but if you’re looking for an alternative, try sunflower seeds or pepitas (aka pumpkin seeds). Drizzle with a few spoonfuls of the sesame dressing and dig on in! Is it weird that I’m already looking forward to having this for lunch tomorrow, possibly breakfast since I can hardly wait? I mean I’ve had dinner leftovers for breakfast before… hey there’s no shame in my game. This Asian charred broccoli quinoa bowl will haunt my dreams. The dressing is freaking amazing and really ties everything together. 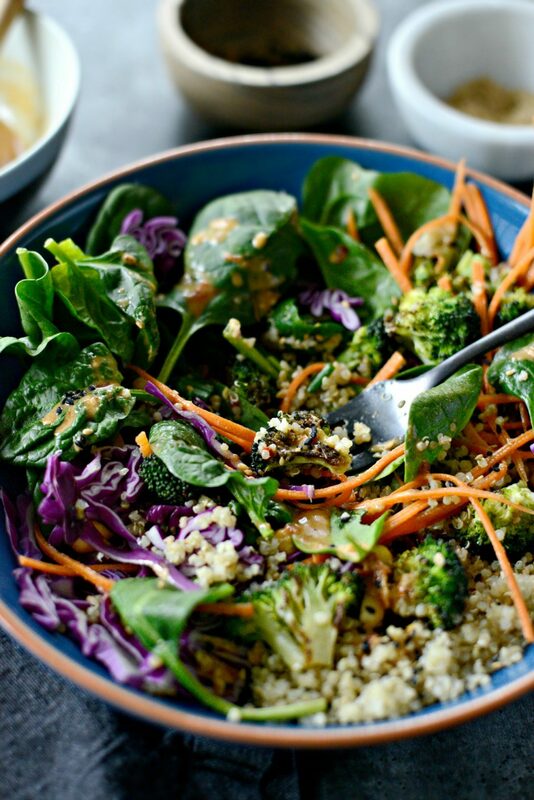 Besides the bomb dressing, I also like the mixture of fresh/raw spinach, carrots and the crunch of the cabbage with the soft quinoa and tender-yet-crispy charred broccoli. 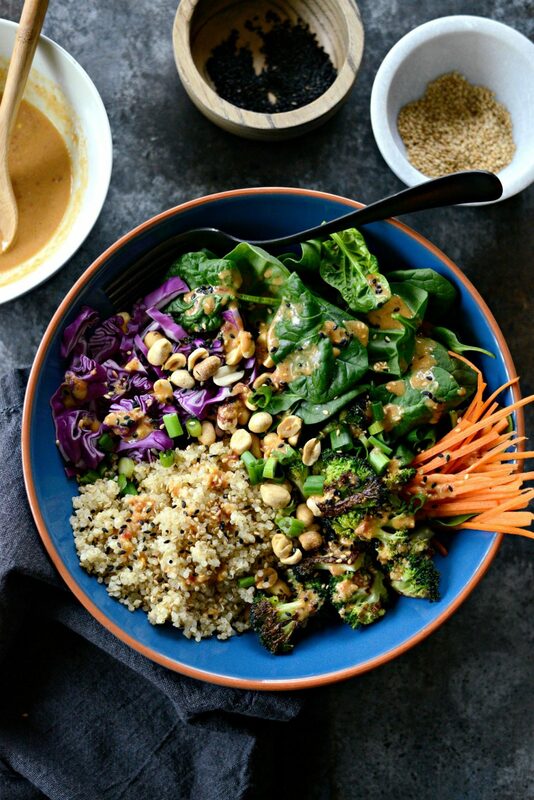 Asian Charred Broccoli Quinoa Bowl is filled with nutritious goodness. Roasted broccoli, spinach, purple cabbage, carrots and quinoa, topped with green onions and chopped peanuts. The easy sesame dressing seals the delicious deal. 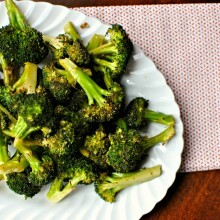 Cut the large crown of broccoli into medium-sized florets. Toss them on a rimmed metal baking sheet with 2 tablespoons of extra light olive oil and a few pinches of kosher salt. Toss well and set off to the side. Meanwhile, bring 2 cups of water to a boil. Stir in the quinoa and continue to boil for 5 minutes. Then cover, turn off the heat and let the quinoa sit for 20 minutes. Once time is up, uncover and fluff with a fork\. While the quinoa cooks, slide the pan of broccoli on the middle rack in your preheated oven for 8 to 10 minutes. While the broccoli roasts and the quinoa cooks, continue to prep the remaining ingredients and make the dressing. Combine all of the dressing ingredients into a bowl and stir to combine. Divide the spinach, quinoa, cabbage, carrots and broccoli into bowls. Top with peanuts, green onions, sesame seeds and then drizzle with a few spoonfuls of the dressing. Would you please list the nutritional values on a serving of this delicious looking soup? I made this today and LOVED IT!!!! The dressing really is tasty. I cooked quinoa ahead of time to save time, and it was put together in less than 15 minutes. Thank you, Laurie!! I’ve never had quinoa before so I wasn’t sure how this was going to turn out, but it was very easy to make and tasty! I added grilled chicken to mine and it was delicious! I’m so glad you decided to give it a try, Niki! I love that you added chicken, I’m so going to do that next time!